The family of a 20-year-old who died in a crash this weekend said he had ‘a huge heart’. Joe-Joe Higgins, 20, of Craignair Avenue, Brighton, was a carpenter and had a passion for cars, his family said. Police said he was driving a black Volkswagen Golf north on the B2112 Common Lane, Ditchling, when it left the carriageway and collided with a tree at about 11.10pm on Sunday (August 26). But despite the best efforts of passers-by and the emergency services, police said he was pronounced dead at the scene. Officers said he was the sole occupant of the car and no other vehicles were involved. Today (August 29), his family paid tribute to him: “Joe-Joe lived his life to the full. He had a passion for cars and always dreamed of buying a Volkswagen Mk1 Caddy. He also had a love for the outdoors – he was in the Scouts until he was 18 and he was in the process of obtaining his Gold Duke of Edinburgh award, and he had plans to explore Europe by Interrail. “Our boy was a fully qualified carpenter, and he loved his profession, as well as all his colleagues old and new. He had the world at his feet. “He had aspirations to be a dad and to play with his favourite toys from his childhood with his kids. He also wanted to find someone he loved and to love them fiercely forever. Joe-Joe leaves behind his mum Chris, dad Tom and sister Ellen. His family wished to thank everyone for their support and messages. 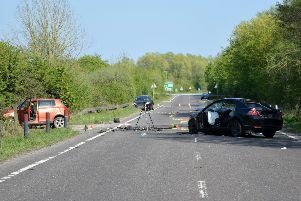 Police are still appealing for anyone who witnessed the crash or the events leading up to it, in particular anyone with dash cam footage, to report it online or call 101, quoting Operation Stanbridge. The road was closed until 5.40am on Monday (August 27) while emergency services were at the scene.